I met Petal in 1978 when my boyfriend, who worked at Gucci, deemed that my wardrobe needed upgrading. My stoner attire was no longer acceptable. The boyfriend asked me to meet him for lunch at Plaza Frontenac. Instead of going to lunch, I was taken walked down the mall to see Petal at Neiman Marcus. Petal was short with dark wavy hair. She was a little overweight but her stylish clothes accentuated her assets and downplayed her flaws. Her hairstyle and make-up gave her an air of chic sophistication. The boyfriend had told Petal I was coming in so she had pulled a rack of clothes for me. I was soon in the dressing room trying on clothes. I had never been in store that had such fancy dressing rooms. Petal made me come out of the dressing room to show her each outfit. She would either say “Darling, that looks divine on you!” or “Darling, that’s not working.” Nobody had ever called me darling before. It felt really strange but I complied with Petal’s directions. An hour later, I was leaving Neiman’s with $800.00 worth of clothes charged to a newly open store account. My head was spinning. I had spent the equivalent of four months of rent on clothes. I had never spent that much money on clothes. I didn’t have nice clothes growing up. I had Catholic school uniforms and two outfits for church. It felt oddly gratifying to have nice clothes even though I was in financial shock. It was the start of a life-long addiction to buying exspensive clothes and dressing well. Petal became my personal shopper at Neiman Marcus. I owe part of my sense of style to Petal who taught me how to dress. Earlier today, I was reading the comments on a Romeo Void video (Never Say Never) I was watching on YouTube. One commenter stated the song reminded her of high school, which were the best times of her life (1982-86). I’m guessing the commenter was now around 50. It struck me that in the last 32 years, her life never again achieved the greatness she experienced in high school. She peaked in high school. How sad is that? By contrast, my Catholic high school years (1970-75) were some of the worst years of my life. I was shy and geeky. I was tall and weighed about 120 pounds. It was the start of my body image problems. The school social order was ruled by the jocks and the cheerleaders. I was deathly afraid of being picked on so I kept a low profile and never made a lot of friends. I was an honor roll student but hung out with the stoners, most of whom were one bad grade from being expelled. I never felt like I fit in with any group. I was isolated in a crowd every day. College was much better. I lived at home while attending the state school in town. It was a commuter school so I was not stuck in a school environment all day. I attended classes in the morning and worked at a Target like store at night. I still hung out with the stoners while avoiding the fraternity house scene. One Saturday night, a girl I met through my best friend took me to a bar with her alleged boyfriend. It turned out to be a gay bar. I found my people. Looking back, I guess she probably figured it out before I did. Even though I found my people, I felt out of place. I didn’t look like the guys in the bar with their fancy clothes and hip hairstyles. I looked like a stoner with shoulder length hair and rock concert clothes. With the help of my first boyfriend, I transformed into one of those guys in the bar. I consider that night to be the start of my life. I’ve had really great times and some really dark times. That’s how life is. I was never the best looking guy in the room but I managed to turn a few heads in my day. I’ve loved and been loved. I’ve also lost love twice. Once to death and once to another man. Even though I’m 61 and single, life is good. I still feel there are some really epic times ahead. I’ll be attending Denver’s March For Our Lives this afternoon. The march starts at 2 and wraps up a 5. I’m meeting friends and coworkers at the March after attending an art workshop at Mai Wyn’s gallery. It should be an epic afternoon. I’m sure I’ll tear up a few times. I’ve written before about protesting with Act-Up in the 1980s. Silence = Death was used to focus attention on the AIDS crisis. The same slogan could be used today. Make your voice known or the gun laws will never change. The kids will not be silenced. The kids have motivated people to protest. The kids will be voting. Change is coming. Are you marching? Drawn to Glamour: Fashion Illustrations by Jim Howard presents the award-winning editorial work by artist Jim Howard, a well-respected member of Denver’s fashion community. 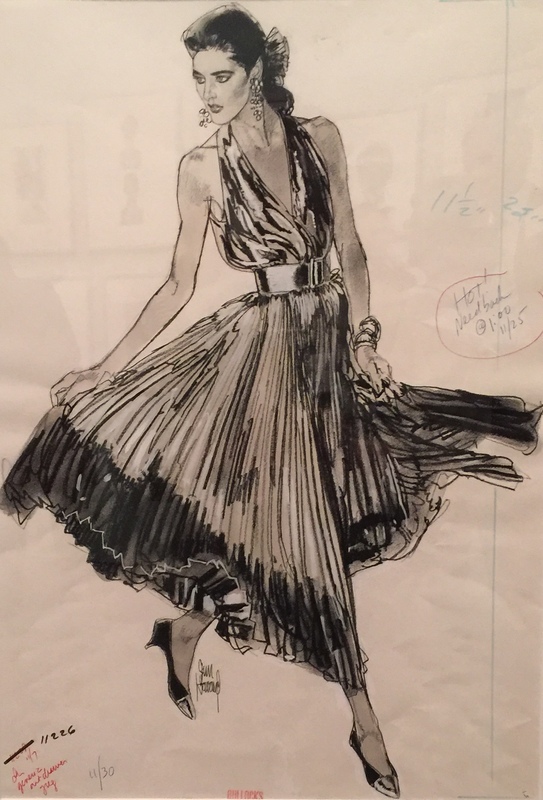 More than 100 works on paper showcase Howard’s four-decade fashion illustration career, starting with his early advertising campaigns for Neiman Marcus in the late 1950s, and through the ‘70s and ‘80s when the fashion illustration industry was at its height. The exhibition offers a nostalgic look at fashion trends set by top ready-to-wear designers, high-end fashion retailers, and cosmetic companies. Neiman Marcus immediately recognized Howard’s talent when he worked as an in-house fashion illustrator and assistant artistic director at its headquarters in Texas. He later moved to New York City to become the artistic director of Franklin Simon and eventually became a freelance artist, remaining in high demand by major department stores, including Saks Fifth Avenue, Bonwit Teller, B. Altman and Company, and the LA-based retailer Bullocks. These department stores employed Howard to create illustrations for fashion houses, such as Dior, Oscar de la Renta, Calvin Klein, and Yves Saint Laurent, which were most often published in The New York Times. In addition, Drawn to Glamour features eight looks from the Denver Art Museum’s fashion collection and four men’s silhouettes on loan from private lenders that capture the essence of some of the most iconic trends of the late ’50s to the early ’80s. Fashion illustration by Jim Howard as seen in the DAM’s Drawn To Glamour exhibit which previewed tonight.